Where does the placename “Altayeskey” originate? The influence of the Ulster Scots on our dialect. People who lived in the Sixtowns from the Bronze Age right up until the end of the 1700`s. Home » Settlement » People who lived in the Sixtowns from the Bronze Age right up until the end of the 1700`s. 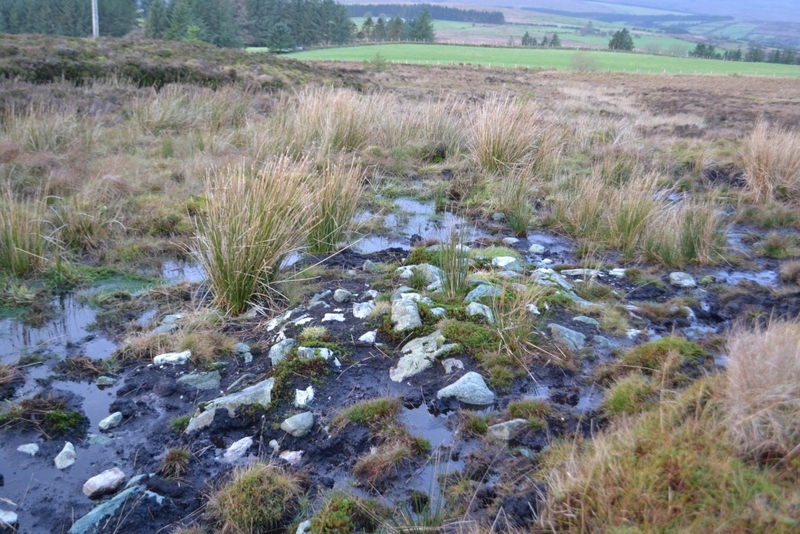 This burial mound is part of a larger Bronze Age cemetery on grazing land in Altayeskey. Here we have the remains of what was likely to have been a Bronze Age ring fort in Moyard. The Bronze age leaves much less traces of its people behind barring the odd ring fort or site of a settlement. It is not until the end of the first millennium that we have any information about who lived in the Sixtowns. The old church of Scrine provides us with some sort of timeline of events and where and how the people lived for the period from the start of the 1200`s right up to its demise at the start of the 1600`s . This version of the history is merely an attempt to explain the change which took place at the end of the first millennium when there was a shift of veneration from St. Patrick to St. Colmcille in south Derry. Lough Patrick is the only religious site dedicated to St. Patrick which has survived from the first millennium. St. Colmcille became the dominant saint after 1,000 A.D. While it is unlikely that either of these noble saints ever set foot in Moneyconey, it is most likely that followers of theirs, various religious orders would have occupied the place for many centuries. We do not know how far back the church really dates but there is mention in the Annals of the Four Masters of the erenagh of that church having been murdered in 1182 AD. There is also an account in the same books, of the church being pillaged by a Dermot McLaughlin from Innishowen, in the year 1202. After sacking the church he was ambushed by an O`Neill chieftain and a battle took place on a hill just south of the church where Dermot was killed and his men defeated. 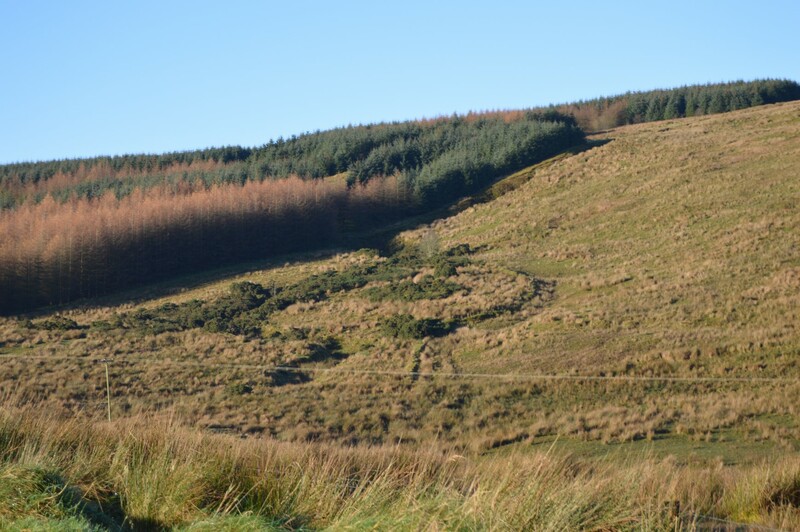 The hill was called Eiscir Mhic Lochlin which means McLaughlin`s esker from that onwards and it is believed that Dermot was buried there. The sub townland of Altaeskey (glen of the esker) gets its name from this hill. Here we are provided with evidence that the Sixtowns was populated at that time at least. The next written reference we have to the church of Screen is of Primate Colton`s Visitation to Derry in 1397. He was sent by the King of England to do a survey on the state of the churches in that diocese. It refers to him staying over at Banagher before making his way through “ye wilds of Glenelly” passing Badony church and following on to Moneyconey and then arriving at Desertcreat. All these churches were connected to the church of Scrine. He was able to say that the country was in a peaceful state and that the churches were in a good state. 200 years later the church of Scrine would lie in ruins after the Flight of Earls. It is believed that Hugh O`Neill`s entourage may have stayed at Moneyconey as he made his way from Tullyhogue out through Glenelly on the same traditional clerical route which Primate Colton took. In another survey of the state of the churches in 1609 it was reported that there was no erenagh resident there and that the roof was off the church. There was however still a vicar called McGillian there. A further survey in 1679 reported that the church had now a new roof as well as other repairs done. The rector listed was Andrew Henderson which indicates new tenants, the C.O.I. had taken over the church. This heralded the arrival of the planters in the Sixtowns and an end to the erenagh as a system of settlement. How did Sixtowns get its name? During the reign of the O`Neills this part of the country was under their control for centuries. The tradition was then, that each church would be granted a piece of land to help raise finance for its upkeep. These church lands were called erenaghs and a man would be elected to manage the erenagh. He too got the title of “ the erenagh” and he would rent out the land to tenants , and of the rent which he would pick up, he would take a cut, the bishop got a cut and the rest went to the upkeep of the church. The Sixtowns, or six baliboes as they were known as then, were the erenagh of the Church of Scrine. The Sixtowns is the only area in the parish which has a collective name. The townlands of Glenviggan, Moyard, Moneyconey, Tullybrick, Cavanreagh and Owenreagh make up the Sixtowns. After the Flight of Earls in 1607 the erenaghs all over Ulster became the property of the Church of Ireland. There are written records that the Church of Scrine was knocked down and built up again several times in its history. It can be taken that while there may have been times when it was in ruins it was operating for most of the time from the 1100`s up to 1607 when it was again abandoned. We can also assume that the erenagh would have been occupied for those periods at least. The first written list of surnames in the Sixtowns. The Hearth Monies Rolls of 1664 are the first written records of who was living in the Sixtowns at any time.The government sent soldiers out around the country to record the names of any house with a hearth in it which would be subject to a poll tax. While they may not be totally reliable they nevertheless give us a very good flavour of the surnames to be found in the Sixtowns at that time. There is something intriguing about the surnames listed. O`Doherty, O`Donnell, M`Laughlin, McColgan, McFadden, McDevitt, O`Deeny and O`Harkin. These are all north Donegal surnames. How did they get there? 1. These people may have been the descendants of Dermot McLaughlin`s army of 1202 who, with their leader dead had nowhere to go and settled down in the area. 2. There was a tradition in the time of the erenaghs, that whichever order was occupying the church, they would bring their own people with them as tenants. Therfore, if an order from Donegal occupied the church then they would bring Donegal people with them. The only surnames which remain from that census are Bradley and Moran. New tenants come to the Sixtowms. After the Flight of the Earls the Church of Ireland began to rent out the lands of the erenagh and while they brought in Planters to occupy some of the better land they also rented other parts to native people, many of whose descendants are still there today. New method of farming and a new system of settlement. By the late 1700`s the planters had brought a new method of farming which they had practised in Scotland. It was called Rundale farming. This system changed the pattern of settlement in the area and from then until well into the 1800`s the people worked a communal type of farming where they lived in clusters of houses called clachans and a leader was elected to divide the arable land out on the basis of need with the mountain land used as common grazing land. It was a very fair system, dividing out land to families on the basis of need and the system could be tweaked over time to keep the divides fair. There averaged about four to five houses to a cluster or clachan, at the start but as the population grew rapidly after the start of the 1800`s there might be up to 8 or 9 houses. The rise in the population created all sorts of problems for the clachans and soon the system began to show the strains and and was no longer functioning properly. At this time the populated area of the Sixtowns would have been confined to the lower parts of Cavanreagh and Owenreagh or small fertile clearances along the upper Moyola in Altayeskey and Moyard. Each family in the clachan would work plots of arable ground close by and they would grow oats and potatoes. 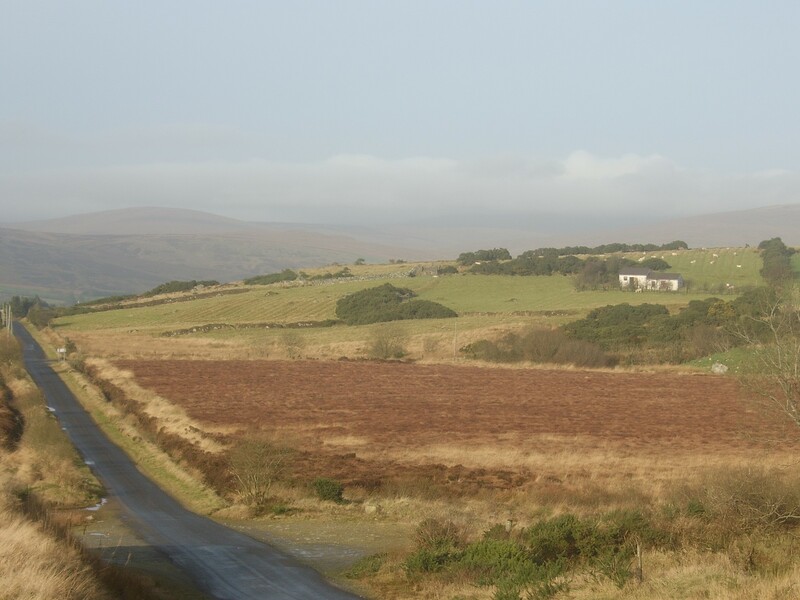 In summer the families would bring their herds up to the mountain pastures above the Moyola valley and they would stay in bothys for the entire summer thereby giving the lowlands a needed rest or the men a chance to harvest the crops free of the threats of rampaging cattle. The women would churn and make butter and they would spin yarn and even took their bees with them to get honey. This system was known as boleying. 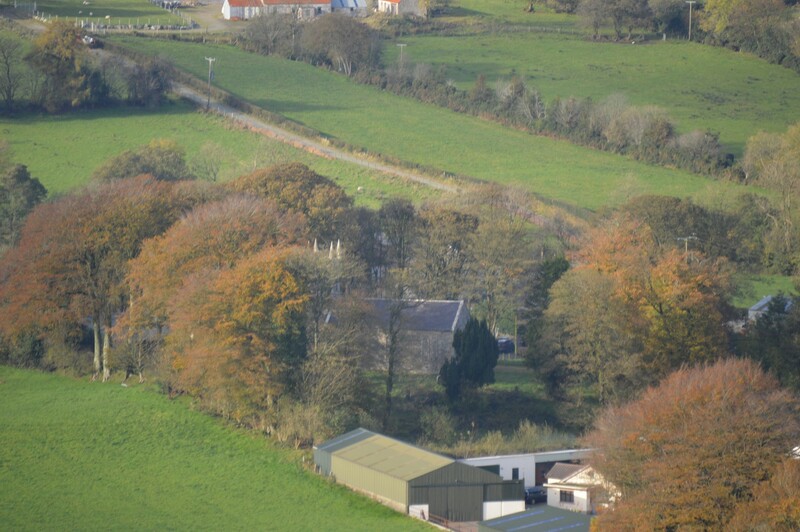 A view of part of Boley which is a subtownland of Tullybrick and former summer pasture lands in the Rundale days. The sub townland of Boley in Tullybrick gets its name from having been a boulie ground in this era. There are the remains of bothys still to be found in the upper parts of the Sixtowns which had been boulie lands.